This article is about the musical. For the book, see How to Succeed in Business Without Really Trying. 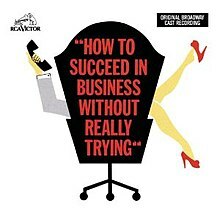 How to Succeed in Business Without Really Trying is a musical by Frank Loesser and book by Abe Burrows, Jack Weinstock, and Willie Gilbert, based on Shepherd Mead's 1952 book of the same name. The story concerns young, ambitious J. Pierrepont Finch, who, with the help of the book How to Succeed in Business Without Really Trying, rises from window washer to chairman of the board of the World Wide Wicket Company. The musical, starring Robert Morse and Rudy Vallee, opened at the 46th Street Theatre on Broadway in October 1961, running for 1,417 performances. The show won seven Tony Awards, the New York Drama Critics Circle award, and the 1962 Pulitzer Prize for Drama. In 1967, a film based on the musical was released by United Artists, with Morse and Vallee re-creating their stage roles. A 1995 revival was mounted at the same theatre as the original production (now named the Richard Rodgers Theatre). It ran for 548 performances and starred Matthew Broderick and Megan Mullally. A 50th-anniversary Broadway revival directed and choreographed by Rob Ashford and starring Daniel Radcliffe and John Larroquette opened on March 27, 2011, at the Al Hirschfeld Theatre and ran for 473 performances. In 1952, Shepherd Mead's satirical book, How to Succeed in Business Without Really Trying, became a bestseller. Playwright Willie Gilbert and fellow playwright Jack Weinstock created a dramatic interpretation in 1955 that was unproduced for five years. Agent Abe Newborn brought the work to the attention of producers Cy Feuer and Ernest Martin, with the intention of retooling it as a musical. Feuer and Martin had great success with the 1950 adaptation of Guys and Dolls and brought in the creative team from that show to work on How to.... Abe Burrows and Frank Loesser set to work on the new adaptation, with rehearsals beginning in August 1961. Burrows collaborated on the book with Jack Weinstock and Willie Gilbert, also serving as director. Their new adaptation became even more satirical and added romance to the story. Loesser wrote both music and lyrics for the show, which was orchestrated by Robert Ginzler. The original Broadway production credited the choreography to an obscure dance director named Hugh Lambert, while the much better-known Bob Fosse received only a "musical staging by..." credit. Abe Burrows explains this in his autobiography Honest, Abe. While How to Succeed... was in its early development, producer Cy Feuer attended a trade show and was extremely impressed by an elaborate dance number created by Lambert, prompting Feuer to hire Lambert to choreograph the new musical. According to Burrows, it soon became clear in rehearsals that Lambert's creative abilities were completely used up in that one elaborate dance number. Bob Fosse was brought in to replace him, but Fosse was unwilling to hurt Lambert's career by having him fired. Lambert's trade-show dance number was recycled as the "Treasure Hunt" dance in How to Succeed..., while Fosse agreed to take a "musical staging" credit for choreographing all the other dance numbers. Burrows also reveals that another crisis arose in rehearsals when former recording star Rudy Vallee wanted to interpolate some of his hit songs from the 1930s. J. Pierrepont Finch, a young window cleaner in New York City, reads the book How to Succeed in Business Without Really Trying as he works. The "Book Voice" tells him that he will succeed if he follows the book's advice. He enters the World Wide Wicket Company searching for a job ("How To Succeed"). Finch bumps into J.B. Biggley, the president of the company, who dismisses him to the personnel manager, Mr. Bratt. Rosemary Pilkington, an ambitious young secretary, helps Finch meet Mr. Bratt. Finch tells Bratt that Biggley sent him, and Bratt gives him a job in the mailroom, where he works with Mr. Biggley's lazy, arrogant, and nepotism-minded nephew Bud Frump. Rosemary dreams of a life with Finch in the suburbs ("Happy To Keep His Dinner Warm"). The fatigued workers rush to get their coffee break ("Coffee Break"). In the mailroom, Finch earns favor with the long-time head of the mailroom, Mr. Twimble, who tells him the secret to longevity at the company ("The Company Way"). Twimble is promoted to head of the shipping department and has to choose his replacement as head of the mailroom. The book warns not to stay in the mailroom too long, so Finch recommends Frump instead of himself. Twimble is reluctant to promote the lazy Frump, but Frump promises to be a good employee ("The Company Way (Reprise)"). Twimble and Bratt are impressed by Finch's apparent selflessness, and Bratt offers him a job as a junior executive in the Plans and Systems department, headed by Mr. Gatch. An extremely attractive but air-headed woman named Hedy LaRue, who is Mr. Biggley's secret mistress, is hired as a secretary. On her first day of work, the male employees are instantly attracted to her, but Mr. Bratt warns them against taking advantage of their employees ("A Secretary Is Not a Toy"). Finch learns from Mr. Biggley's secretary, Miss Jones, that Biggley is a proud alumnus of Old Ivy college. In the elevator at the end of the workday, Rosemary's fellow secretary Smitty helps her and Finch set up a date ("Been a Long Day"). Frump runs into Biggley and Hedy and realizes their relationship, and he blackmails Biggley into giving him a promotion ("Been a Long Day (Reprise)"). Finch arrives early Saturday morning and sets up the office so it looks like he has been working all night. Biggley believes Finch's ruse, and Finch convinces Biggley that he, too, is a proud alumnus of Old Ivy (a "Groundhog"), and they sing the Old Ivy fight song ("Grand Old Ivy"). Biggley insists that Finch be given his own office and secretary, Hedy. With the book's help, Finch realizes that Biggley must be Hedy's advocate and sends her on an errand to Gatch, knowing that Gatch will make a pass at her. Gatch falls for the trap and is dispatched to Venezuela, and Finch is promoted to his position as head of Plans and Systems. At a reception for the new Advertising Department head, Benjamin Burton Daniel Ovington, Rosemary hopes to impress Finch with her new "Paris original" dress, but all the other women arrive at the reception wearing the same dress ("Paris Original"). Frump schemes for Biggley to catch Finch kissing LaRue in his office, but after LaRue blackmails Finch into kissing her, he realizes he's actually in love with Rosemary ("Rosemary"). After some farcical complications, Frump and Biggley walk into the office just as Finch embraces Rosemary. Ovington is forced to resign when Biggley learns that he is a graduate from Northern State, Old Ivy's bitterest rival (a "Chipmunk"). Biggley names Finch Vice-President in Charge of Advertising. Biggley leaves as Finch and Rosemary declare their love for each other, and Bud Frump vows revenge ("Act I Finale"). Two days later, Rosemary has been neglected by Finch. She decides to quit, but her fellow secretaries convince her to stay because she's living their dream of marrying an executive. ("Cinderella, Darling") (In the 1995 revival, this song was replaced with a reprise of "How to Succeed", with the lyrics suggesting ways in which a woman can get hold of a man's financial assets). Vallee, Martin and Morse on stage, 1961. The book warns Finch that because Vice-President of Advertising is a bad position, he needs a brilliant idea. Bud Frump slyly tells Finch his idea for a treasure hunt, which Finch loves, unaware that Biggley has already heard the idea and rejected it. Finch shares the idea with Rosemary, who tells him that she'll stay with him no matter what happens ("Happy To Keep His Dinner Warm (Reprise)"). Hedy tells Biggley that she is unhappy as a secretary and is leaving for California. He begs her to stay and tells her he loves her, and she agrees to stay ("Love From a Heart of Gold"). In the executive washroom, Finch gives himself a pep talk while, behind his back, the other executives and Frump plot against him ("I Believe In You"). Finch presents "his" idea to Biggley: he will hide five thousand shares of company stock in each of the ten offices around the country and give a television audience weekly clues as to their whereabouts. Biggley accepts this idea when Finch explains that each clue will be given by the scantily-dressed World Wide Wicket Treasure Girl: Miss Hedy LaRue. During the first television show, Hedy is asked to swear on a Bible that she doesn't know the location of the prizes. Hedy panics and reveals the locations to the entire television audience, which prompts all the Wicket employees to tear apart the offices looking for them. The book tells Finch, "How To Handle a Disaster. ...We suggest that your best bet if you are the cause of the Disaster is to review the first chapter of this book: 'How to Apply for a Job'." The executives, including Chairman of the Board Wally Womper, are waiting in Biggley's office for Finch's resignation. Rosemary again tells Finch that she'll stand by him no matter what ("I Believe in You (Reprise)"). About to sign his letter of resignation, Finch mentions that he'll probably go back to washing windows. Womper is drawn to Finch as he, too, was a window washer and they both "had a book": Wally's book was a book of betting records. Finch blames the treasure hunt on Frump, also mentioning that Frump is Biggley's nephew. Womper is about to "clean house from top to bottom", when Finch steps in on everyone's behalf. Finch tells the executives that even though the business world is a place filled with betrayal and competitiveness, the World Wide Wicket staff is like a family to him ("Brotherhood of Man"). Everyone is spared except Frump, who is fired because he is Biggley's nephew. Biggley remains president, Womper retires to travel the world with his new wife, Hedy, and Finch becomes Chairman of the Board. Rosemary stands by his side and inadvertently inspires him to aspire for the Presidency of the United States. Frump gets a job washing windows, swearing revenge against Finch ("Company Way (Finale)"). J. Pierrepont Finch - a window washer who applies for a job at the World Wide Wicket Company. Rosemary Pilkington - a secretary at the World Wide Wicket Company who instantly falls in love with Finch. J.B. Biggley - The boss of the World Wide Wicket Company. Bud Frump - Biggley's arrogant and lazy nephew. Hedy LaRue - Biggley's attractive and dim-witted mistress. Miss Jones - Biggley's immovable secretary who is charmed by Finch. Mr. Twimble - Head of the mail room for 25 years; finally gets promoted to the shipping department. Miss Krumholtz - a secretary of Mr. Gatch, then J. Pierrepont Finch. Mr. Benjamin Burton Daniel Ovington - prospective head of the advertising department until Finch reveals that he has graduated from Biggley's college's arch-rival; he is often referred to in the show by his initials, "BBDO." Mr. Wally Womper - the Chairman of the World Wide Wicket Company. He is traditionally played by the same actor as Twimble. 1995 revival replacement: "How to Succeed (Reprise)"
The show opened on Broadway on October 14, 1961 at the 46th Street Theatre, and closed on March 6, 1965 after 1,417 performances. The cast starred Robert Morse as Finch, Bonnie Scott as his secretary Rosemary, Charles Nelson Reilly as Bud Frump, and Rudy Vallee as the company president. Virginia Martin played Hedy LaRue. The West End production opened at the Shaftesbury Theatre on March 28, 1963 and ran for 520 performances. It was also directed by Burrows and Bob Fosse, and featured a new London cast. Warren Berlinger and Billy De Wolfe starred as Finch and Biggley respectively, with Patricia Michael as Rosemary, Josephine Blake as Smitty, David Knight as Bud Frump, Olive Lucius as Miss Jones, Bernard Spear as Mr. Twimble, and Eileen Gourlay as Hedy La Rue. A Broadway revival opened at the original theatre, now renamed the Richard Rodgers Theatre, on March 23, 1995 and closed on July 14, 1996 after 548 performances. It was directed by Des McAnuff, choreographed by Wayne Cilento, with musical direction by Ted Sperling. Matthew Broderick starred as Finch and Rosemary was played by Megan Mullally. The cast also included Ronn Carroll as J.B. Biggley, Victoria Clark as Smitty, Jeff Blumenkrantz as Bud Frump, and, in a pre-recorded performance, Walter Cronkite as the Book Voice. The replacements for Mullally and Broderick were Broderick's future wife Sarah Jessica Parker as Rosemary and John Stamos as Finch. Ralph Macchio was offered the role of Finch when Broderick left the show, but opted to take the role in the touring cast instead. Broderick made a brief return to the show so he could star opposite Parker. Robert Mandan played Biggley in its California pre-Broadway run but chose not to transfer to New York. The wardrobe was designed by Susan Hilferty and is on display at the Costume World Broadway Collection in Pompano Beach, Florida. A national tour of How To Succeed ran beginning in Baltimore in May 1996 and ended in Milwaukee in June 1997. Other stops included Sacramento, Portland, and Seattle. The national tour cast featured Ralph Macchio as J. Pierrepont Finch, Shauna Hicks (Rosemary Pilkington), Richard Thomsen (J.B. Biggley), Pamela Blair (Hedy LaRue), and Roger Bart (Bud Frump). Both Macchio and the production played to favorable reviews. Daniel Radcliffe was featured in a reading in December 2009, with Rob Ashford as director and choreographer. Radcliffe starred in the revival for ten months, which began previews at the Al Hirschfeld Theatre on February 26, 2011, with the official opening on March 27, 2011. Rob Ashford directed and choreographed. Other cast included John Larroquette as J.B. Biggley, Rose Hemingway as Rosemary Pilkington, Mary Faber as Smitty, Tammy Blanchard as Hedy La Rue, and Christopher Hanke as Bud Frump. Anderson Cooper recorded the Voice of the Book for the production. The production was nominated for nine 2011 Tony Awards, including for director-choreographer Rob Ashford and as Best Revival of a Musical. John Larroquette won the Tony Award for Best Featured Actor in a Musical. Darren Criss succeeded Radcliffe in the role of J. Pierrepont Finch for a limited, three-week engagement January 3–22, 2012. Criss was awarded the Broadway.com Audience Choice Award for Favorite Replacement for his performance in this role. Beau Bridges replaced John Larroquette as J.B. Biggley starting January 3, 2012. Nick Jonas took over the role of Finch on January 24, 2012. Jonas was nominated for a 2012 Broadway Beacon Award for his performance in this role. Michael Urie replaced Christopher Hanke in the role of Bud Frump starting on January 24, 2012. The production closed on May 20, 2012 after 30 previews and 473 regular performances. In 1967, United Artists released a film adapted and directed by David Swift. Robert Morse, Rudy Vallee, Michele Lee (who replaced Bonnie Scott as Rosemary during the show's Broadway run), Sammy Smith and Ruth Kobart recreated their roles for the film, and Fosse again choreographed. Several songs were omitted from the score, such as "Love From a Heart of Gold," "Happy to Keep His Dinner Warm," "Cinderella Darling," "Paris Original," and "Coffee Break", although there are musical and verbal references respectively to the last two. In the film's finale, Frump was among the entire company singing a finale version of "The Company Way." The musical was adapted by Abe Burrows for a television production starring Alan Bursky, Susan Blanchard and Larry Haines, directed by Burt Brinckerhoff. The production aired as an ABC Comedy Special on June 27, 1975. The original 1961 Broadway production opened to highly positive reviews. New York Times critic Howard Taubman wrote, "It stings mischievously and laughs uproariously...It belongs to the blue chips among modern musicals." Taubman praised the show's "adult viewpoint and consistency of style", stating that Burrows had "directed brilliantly" and that Loesser had "written lyrics with an edge and tunes with a grin...the songs sharpen the ridicule." Taubman stated Robert Morse played Finch "with unfailing bravura and wit", pronouncing Finch, as portrayed by Morse, "a rumpled, dimpled angel with a streak of Lucifer." John Chapman of the Daily News deemed it "the definitive musical about high life in the city" with "perfect musical comedy construction." Chapman declared that "Loesser is the perfect man for his end of the show - the songs; for he is a cynic without being tough. He has not put in a note of music or a syllable of lyric that doesn't carry the story along." Richard Watts, Jr. of the New York Post wrote, "In its first performance at the 46th St. Theater Saturday night, its satire, humor, book, music, lyrics, cast, staging, choreography, setting and general gaiety of spirit combined in a smooth, fast pattern of expert showmanship to make the occasion a delightful event." In the New York Herald Tribune, critic Walter Kerr stated, "Not a sincere line is spoken in the new Abe Burrows-Frank Loesser musical, and what a relief that is...How to Succeed is crafty, conniving, sneaky, cynical, irreverent, impertinent, sly, malicious, and lovely, just lovely." He opined that Burrows was most responsible for the musical's success, pronouncing, "What most distinguishes a sassy, gay, and exhilarating evening is--you'll never believe this--the book...Gags are subordinated to impish running commentary; Mr Loesser's perky score is subordinated to the merry malice that is afoot." John McClain of the New York Journal American declared it to be "The most inventive and stylized and altogether infectious new musical in recent recollection", pronouncing it "the sheerest farce..gay, zingy, amoral, witty and shot with style. It comes very close to being a new form in musicals." He praised Loesser's score, saying, "All the music has been integrated into the plot, to fit the mood as well as the momentum. His lyrics are generally superb." McClain particularly noted Bob Fosse's choreography, saying that his dances were "a whole new chapter in ingenuity." Norman Nadel of the New York World-Telegram and Sun declared, "Whichever white winged angel watches over theatrical enterprises was sitting on top of the 46th St. Theatre Saturday night, joyously blasting away on a solid gold trumpet." In contrast, in their reviews of the 2011 Broadway revival, the New York Times chief theater critic Ben Brantley warns that the show’s book writers "failed to give Ponty any defining traits beyond all-consuming ambition" and that "you don’t particularly want [Daniel Radcliffe's] character in the show to succeed, and that really is a problem." Charles McNulty of the Los Angeles Times opined that the musical "is hampered by a dated book" and that its "episodic structure now seems as belabored as a sitcom plucked from a rusty time capsule", while "all the romantic brouhaha with moony secretaries is beyond retro." ^ a b c d e f "Frank Loesser - How to Succeed in Business Without Really Trying". Frank Loesser Enterprises. 2008. Archived from the original on 2008-09-30. Retrieved 2008-08-02. ^ "How To Succeed in Business Without Really Trying". TCM. 2008. Retrieved 2008-08-02. ^ Bloom, Ken; Vlastnik, Frank. Broadway Musicals: The 101 Greatest Shows of All Time. New York: Black Dog & Leventhal. ISBN 1-57912-390-2. ^ "Plot & Synopsis: How To Succeed In Business Without Really Trying". Music Theatre International. Retrieved 2011-08-27. ^ "HOW TO SUCCEED IN BUSINESS WITHOUT REALLY TRYING To Play Final Performance on Broadway Sunday, May 20th". Retrieved 8 May 2012. ^ "Best Musical Theater Album". grammy.com. Dec 2, 2011. Retrieved 2 Dec 2011. Suskin, Stephen (1990). Opening Night on Broadway: A Critical Quotebook of the Golden Era of the Musical Theatre. New York: Schrimmer Books. ISBN 0-02-872625-1. Wikimedia Commons has media related to How to Succeed in Business Without Really Trying (musical). This page was last edited on 22 March 2019, at 01:16 (UTC).